H is for High Level / Bloodstone. The H series is an odd one, even in a group that includes a lot of odd ones. 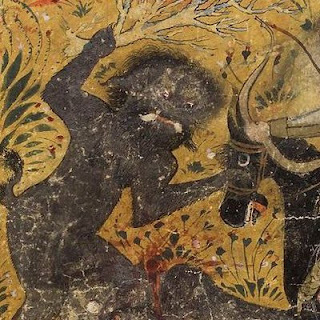 There is a connecting story, of sorts; dealing with the interference of Orcus, but there are other things going here. The first adventure, H1 Bloodstone Pass was for 1st edition AD&D, but was also part of their new Battlesystem mass warfare rules. H2 Mines of Bloosstone is more of a straightforward adventure. H3 brings us back to Battlesystem and finally H4...well, let me get to H4 in just a bit. H4 The Throne of Bloodstone was fairly notorious back in the day. It was another adventure I bought and then gave to my DM with screams of "run this!" We ran it the first summer I was home from college. The basic plot is that all the trouble caused in the previous modules was not just due to a cult of the Demon Prince Orcus, but Orcus himself. In H4 the characters went to his lair in the Abyss and killed him. Ok...where to begin with this one! Well let's start with that cover. 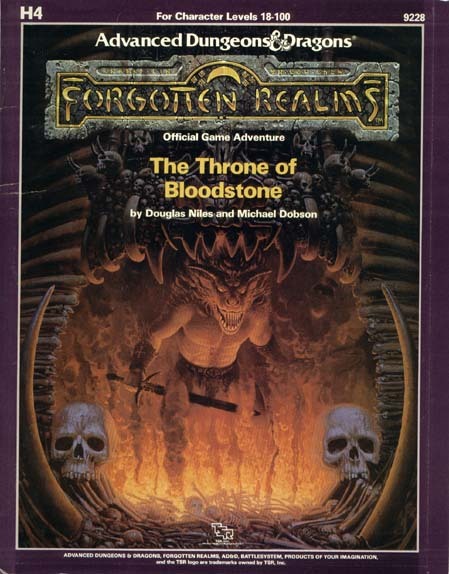 This is the only adventure in the series that is labeled for the Forgotten Realms. The first, H1, assumed any world. There is Orcus himself coming out of the mouth hell or something (the Abyss really). Oh and the recommended levels...let's see, 18 to 100! 100th level characters? I have to admit that was one of the reasons why I grabbed this. We had been playing a LONG time and I have many characters well past the by-the-book levels. AD&D at the time really only went to about 25th level, but figuring out higher levels was not that big of a deal. Generally speaking adventures topped off at 20th level. So I took some characters, right around 20th - 25th level...and a couple of them died right away! This was not an adventure to screw around with. The other thing you notice with this adventure is that it is long. The module itself is like 96 pages and tons of maps. I seem to recall it took us a while to get through it too, most of the summer I was home from college. You do get to fight Orcus in the end, as well as Tiamat, Baphomet, a giant Red Dragon, and potentially Asmodeus. It is just a deadly, deadly module. After this I retired all the characters that went through. After all what was left for them to do? 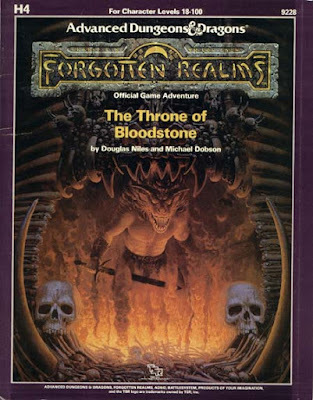 Fighting Orcus is a theme that D&D would come back to again and again. 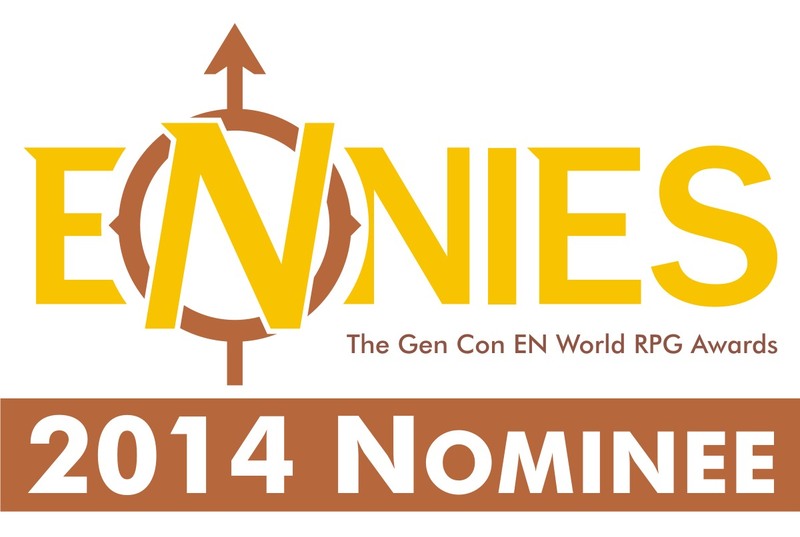 The HPE series for 4e, especially the Epic modules. In 2nd edition the events of this module would later play out as part of the Dead Gods adventure. For me, today, this adventure is a template for other high level adventures. While the module said up to 100th level, there are not really many qualitative differences between a 25th level character and a 100th level one. Fighters top off in attacks. Clerics top off on undead turning at 14th level and so on. I was a little disappointed that the AD&D designers did not take a page from the D&D team in this case. At this point in time AD&D and D&D were two different, but similar, systems. D&D characters could go to 36th level and even become immortal. Some of that would have been helpful here. Much like the E modules, this module is likely to use as a source of material, but not so much as the adventure itself. Still...running it could be a lot of fun. In truth fighting Orcus is a always a good idea. He is a demon, he wants to destroy everything AND in the E series he desires to become a god. In truth this H series and the E series only scratches the surface when it comes to fighting Orcus. And even if you do kill him there is still the Dead Gods adventure that deals with him coming back from the dead. In fact there are no lack of products out there to let you match up against the Demon Prince Orcus. This is certainly an end-game adventure, after this buy that castle in southern Nyrond, hang your +5 Holy Avenger over the mantle, hire some Valley Elves to make some wine and kick up your heals and smoke pipe weed to end of your days. Good heavens - I'd be terrified to play a game that was that deadly to characters! Sounds like you had to be really badass to come through it. I don't think I've ever played a character to a level that would fit any of those, but I'll admit that the idea of Level 100 characters makes me want to check that one out, too. At that point, it doesn't seem like rolling dice would even do anything. My story is almost identical to your's about this module. Summer home from college, 20+ level AD&D characters from weekly game during high school, and then retired them after surviving the module. I played my favorite character for the last time, a 22nd level Paladin (cavalier sub-class),named Coleston. I own copies of H2 and H4, long ago "borrowed" off a buddy who (like you and John) ran the Bloodstone series for his players during a college summer. The only reason I didn't pick up the full set was I had neither access nor interest in BattleSystem. I've never had the opportunity to play in or run either adventure. H4 is just about the most ridiculous module I've ever encountered, right down to the cigar-smoking solar and the set-piece battles with Tiamat ("here, we'll just beam you into her lair"). That's the kind of stuff I was running back when I was 11 or 12. There's a lot of cringe-worthy stuff in it...hi-tech cannons in Orcus's lair and the most boring plane of the Abyss ever for Demogorgon. I don't know it all just rubs me the wrong way. H2 has some rail-roady bits, but it always struck me as a fairly decent dungeon crawl for high level characters. Just never had the group to use it with. If there is something I really miss from my AD&D days (since I don't play AD&D anymore) it's the demons and demon lords of that particular edition. Much as AD&D billed itself as being "setting-less" there was a very specific cosmology to the game with real, horror movie style evil and monstrous "other powers" of the late night, unrated TV-faire variety. THAT stuff was pretty cool, and it conjures powerful nostalgic feelings in me when I take the time to think about it...feelings that might (one day) lead me back to AD&D, or something like it. 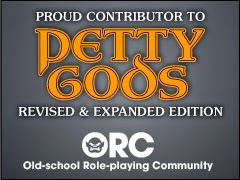 Even if I might deride the Bloodstone modules (for a variety of reasons, including hawking both the Forgotten Realms and BattleSystem), the premise/themes they use are VERY "old school D&D." I just dislike the execution. Of course, I hold Q1 to be the greatest high level adventure ever published, so what do I know? Well done! on being up to date with your A-Z challenge posts. Level 100?! What the hell lol I'm not even sure what the level cap was when I played D&D 3rd edition? or was it 3.5? I can't tell, honestly. It just says D&D D20 System, sooooo yeah. Anyways, I don't think anyone ever got to level 10 let alone 100. Granted we didn't get to play much. Thanks for stopping by, and thanks for sharing these modules. They seem pretty sweet!